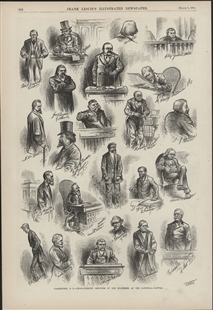 The contested 1876 Presidential election was the subject of innumerable news illustrations over the course of its lengthy resolution. 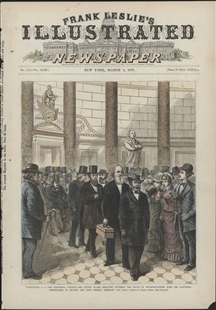 This cover image shows the Senators of the Electoral Commission—which had begun hearing arguments on February 1—walking through Statuary Hall toward the House Chamber with the electoral certificates under investigation in hand. Although the sketch depicts an event that took place on February 12, the print was published March 3, 1877—the day after Rutherford B. Hayes was declared the winner of the election.